Interior Minister visits the Jewish community of Hevron, prays at the Cave of the Patriarchs. Interior Minister Aryeh Deri (Shas) on Tuesday visited Kiryat Arba and Hevron, and prayed at the Cave of the Patriarchs with other Shas MKs. After a visit to the Machpela House, Minister Deri continued to a display at Beit Hadassah which tells the history of the Jewish community in Hevron. After viewing the exhibit, Deri toured the local museum as well and signed the guest book. 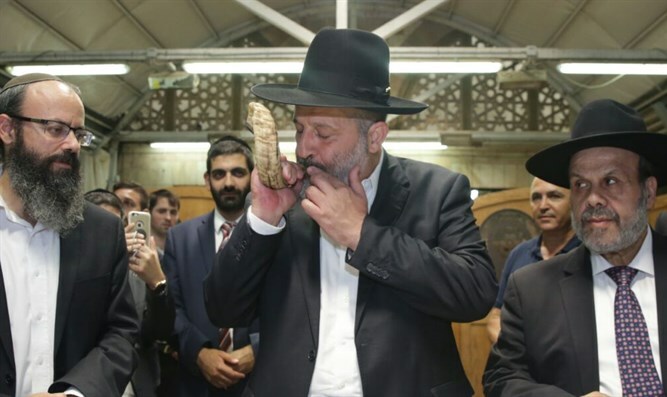 "There is a large community of observant people here, it was a pleasure to see the students in the Cave of the Patriarchs, and it is very exciting to be here before Rosh Hashanah, and to ask our forefathers and foremothers to pray for us," said Deri. "I am happy to see that soon, after long and intense work, the Jewish community in Hevron will be recognized as a local council." "There is no Jewish child who does not know who Abraham, Isaac and Jacob are. We must bring them to the Cave of the Patriarchs so they get to know the place - that is very important," continued the Shas chairman. "The solution to the Amona evacuees went from one ministry to the other until Minister Deri said he had found a solution. We are very connected to Knesset members, who have toured with us in many communities in Judea and Samaria. The connection between us is unmediated and is real and true," added Ro’eh.